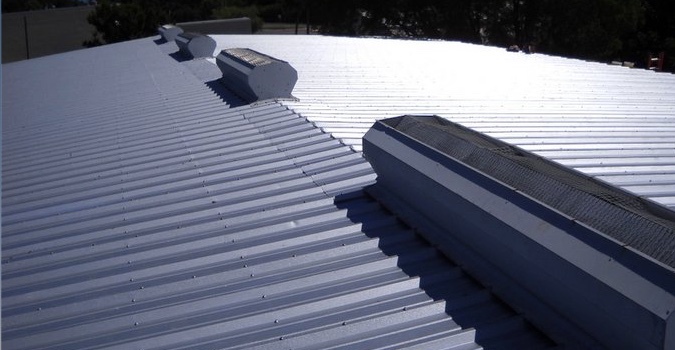 If you are seriously considering replacing your commercial metal roof, there’s a viable and economically advantageous alternative – a full metal roof restoration. Our unique metal roof restoration process will make your metal roof look like new and protect it from all of our Texas extreme weather. After fixing all of your metal roof’s issues, we’ll apply our top quality, high tensile coating over the entire roof, setting the industry standard for affordability and quality. If you’re looking for color retention and the best protection your metal roof can have against the elements, our process and coating is your best option. Some options are Energy Star rated and classified as “cool roofing” with bright white colors. Long term material and system guaranties back up all of our work. Our motto is “Don’t’ Replace it….Restore It!” because its a fantastic alternative to completely replacing your metal roof. With the way they are inherently designed, just like other roofing systems, metal roofs will eventually fail. 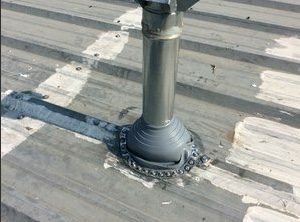 Seams and fasteners are two of the main culprits when it comes to areas on your roof that are susceptible to leaks. The waterproofing processes for both metal roof restoration and metal roof repair are fairly similar. When you restore your metal roof, you make the entire structure watertight, opposed to repairing, where you are just addressing the specific areas that are currently leaking. For some managers and building owners that are on a tight budget, since a full restoration, despite being worth every cent invested, is still a major expense, we have excellent programs in place that take care of just repairs. To figure out which areas need to be prioritized and work within your budget, the first step you’ll need to take is finding and hiring a professional commercial metal roofing contractor to conduct a thorough inspection of your roof. If the fasteners are exposed to the elements, every single screw is an area for potential problems. To seal out water from each screw, there’s a rubber washer initially installed when the roof itself is built. Moisture will get through them and into your building when the washers decay, become brittle and crack over time. Another potential area for water getting into your property is the edges of the metal sheets and panels. During high wind conditions, water will get pushed up and in between the metal sheets through a wicking action. To combat this, there is a sealant that is typically applied between the sheets and panels. However, just like the washers under each screw, over time this sealant breaks down and moisture will get through it and inside. If you maintain your metal roof properly, the ROI you will attain, due to their long lifespan, will be significant. It will hold up well no matter what type of weather event is thrown at it – extreme heat, heavy snow, high winds, hail and pouring rain – none of it matters. It will last 2 or 3 times as long as other types of commercial roofing systems, making the increased investment you’ll need for a metal roof worth every penny. If your roof is breaking down prematurely, you may have had an inferior coating applied originally to your metal roof. Silicone products are higher quality and a better option than products based on acrylic materials. Silicone doesn’t fade, haze, chalk, degrade or was off like acrylic products will. It’s a very strong material for restoring or repairing a metal roof. The environment benefits from silicone products. They have lower VOC values and longer life cycles, leaving a smaller footprint on the environment. there are also local programs where you can compare Energy Star ratings of the various material choices. You can reconsider and improve your building’s R-value by increasing its insulation as part of this process. The foam coating on the roof’s exterior reflects the sun’s heat and UV rays in addition to adding a layer of insulation. To help you go through the various material choices, you should hire a commercial roofing contractor that has experience with commercial metal roof restoration. Every metal roof is unique to the building its installed upon. In order to increase and improve our selection of quality products and materials that we can offer our customers, we closely monitor every repair, restoration, replacement and installation we complete.